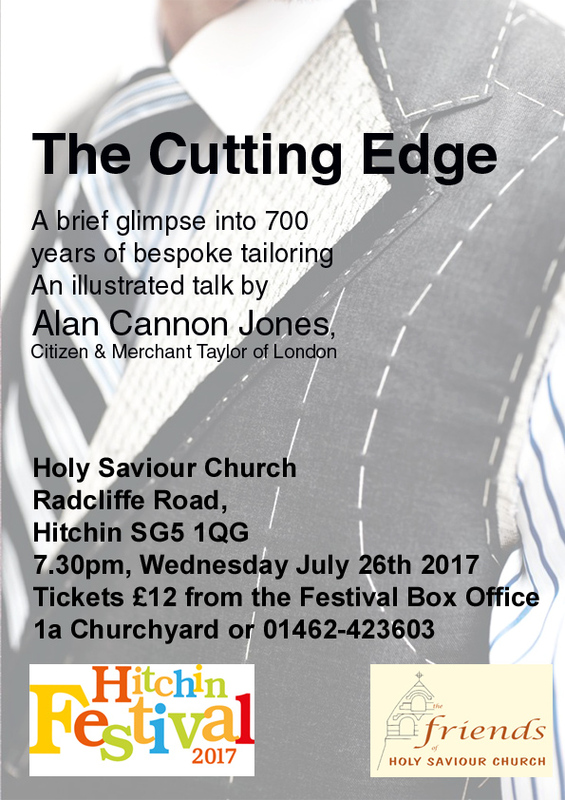 The Friends of Holy Saviour present a fascinating illustrated talk by Alan Cannon Jones – Citizen and Merchant Taylor of London. Drawing on the experiences of a career stretching from tailoring apprenticeship to membership of the Merchant Taylors’ Company, Alan’s talk will give insights into the world of bespoke tailoring, including the Merchant Taylors Company, 1865 and the Tuxedo, Ecclesiastical tailoring, Salvador Dali – and more! Tickets cost £12 (Friends £10) including refreshments; available from Clare Fleck or Gill Chidgey 01462 423603, or the Hitchin Festival Box Office, 1a Churchyard. This entry was posted in Events on 24/06/2017 by admin.